III. How Does Google Talk Video Work? Who Developed Google Talk Video? Lachapelle was the "Vice President of Product Management" at Marratech. Marratech is the company in Sweden from which Google bought the software in April 2007. What is the Purpose of Google Talk Video? Google talk video has many purposes. It's main intent is to enhance the communication with a variety of people throughout the world. Space is no longer a barrier for communication when you can use Google talk video. What Types of Videos Can You Add in When Interacting Using Google Talk Video? This is a YouTube video that has been inserted in to a video chat. Why Was Google Talk Video Developed? Getting started with Google Talk Video is relatively quick and simple! The information below will help you get started. What is the First Thing I Need to Do? From there, simply fill in your information and follow the prompts to set up your account. It's as simple as creating a Gmail account. From there, you can type the person's Gmail address who you wish to be able to chat with. Finally, click "Send Invites." If that person accepts your invitation, you will then be able to chat back and forth and hence use Google Talk Video Chat if you both have a webcam. To determine if someone is available to chat, there will be a green clock beside their name under your chat tab. If there is a green video camera symbol, they are available to video chat as well. The following video by developer Serge Lachapelle shows you how to use Google Talk Video from this point. Now you are ready to chat it up! 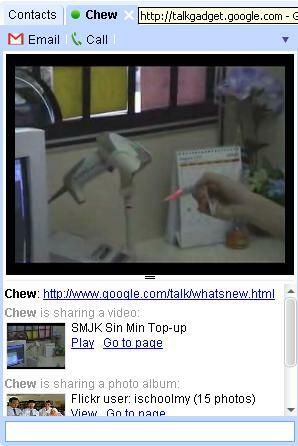 Finally, Google Talk Video can be used in conjunction with the chat function on Google Talk. For instance, one can video chat and use regular chat simultaneously. There are many other applications equipped with the function of voice and video chatting in China, such as QQ, Live Messenger (MSN), TOM-Skype, BaiduHi. Compared to Google Talk Video, QQ is quite convenient, because you do not need to re-install plug-ins. The function is integrated in the software itself. Simply click the Toolbar button on the video and wait for the other party to agree so it can be a video chat. Generally speaking, QQ video resolution is relatively low. This also depends on the personal computer-definition camera. Compared to MSN, the picture quality of QQ is not particularly great. In contrast, QQ has better audio quality. MSN is one of the best four personal instant communication tools in China. A large number of groups, specifically office workers, who use it to communicate with others. Someone found that MSN seems to use a similar "Image Smoothing" or "Dynamic Compensation" technology. Whether it is static or dynamic, the video qualities are much better than other video chat softwares. In audio comparison, MSN has made an excellent impression to the masses. In addition to better restoring the true voice, it is fluent instead of being delayed or interrupted. MSN is well-known for its concise interface, users can easily get started. The main reason is that its video and audio chat button has been placed at the location of the eye-catching message window. When you click on the icons, an invitation can be issued. However, since the premise of talking to anyone is to be aware of his or her e-mail address, the objects to communication are inevitable limited. MSN does not provide many unique features. We cannot capture or preserve the video image; the only option is to set the size of video images. Its very easy to get started. First you would need to go to messenger.live.com/ . After going to this website you have to download msn's software and go from there. As a new video-chat tool that has been in use than six months, G-talk is still unfamiliar to many people all over the world. G-talk Video is very similar to other chat tools that provide video chat function, like the applications we list above. In What Ways is G-talk Video Unique and Different with Regards to Other Applications? (3) Chat WAY: The function is embeld in G-mail, rather than a separate chat tool. Google Talk Video can also be used in a variety of interesting ways and situations. These unique uses allow people to communicate and work together in situations that would not normally be possible, especially when face-to-face communication isn't possible. This can benefit anyone in allowing communication whether it is family members, business partners, friends, or any other forms of relationships between people. All of these people can use Google Talk Video for communication, such as catching up with family members, saying hello to a friend, holding business meetings and conferences, as well as sharing your opinions on blogs, or debating your opinion. These means of communication would only be able to be accomplished face-to-face without an application like Google Talk Video. This kind of application has made communicating much easier. Along with businesses being able to use this to hold meetings and talk to employees and clients, this can also be incorporated in the classroom by allowing students to work with other people that are not actually in the classroom but from anywhere in the world. Google will also allow students to communicate from their homes to work on projects when they may not be able to meet face to face with other students. Through this new application with Google, businesses can hold meeting, students can learn, teachers can teach, and old friends can catch up. The power that Google has given to their customers is can save time and money in all aspects of life. Google Talk Video can be used in many different aspects of the classroom. This ranges from meeting with international partners throughout the world to simply viewing an experiment that is taking place outside of your viewing area. The possibilities are limitless. It is up to you to determine where you will go with it. Below are a variety of different lesson plans for all ages. Please click the links below to download the example lesson plans. In this lesson plan, students will have a chance to talk to Chinese students who are approximately their age. This lesson will create the most effective form of communication between parents/teacher. The purpose of this activity is to create a concept of primary colors and their functions. The purpose of this activity is to help students realize the importance of Jackie Robinson. In this series of lessons, students will speak through Google Talk Video with students from a class in a Spanish-speaking country to increase their communication skills with a fluent speaker. Additionally, they will be able to help their Spanish-speaking partner with English. Write about local government procedures. Present specific sides of current local government issues. In this lesson, students will communicate via Google Talk Video with a local government official (ex: state congressman). Students will "interview" the government official about the local procedures in government and additionally about a current "hot topic." Students will then be asked to write a paper about the issue, presenting the side of the argument their official holds. Work in groups to combine geometric knowledge and complete a large proof. Students will work in groups to write basic geometric proofs assigned to them. Then, as a class, students will work with a partnering class to combine the parts of the proof into a large proof. •Use Google Talk to incoperate what they learned. Students will read Shakespeare's Hamlet. Then, they will get into groups and discuss five main points from each scene. The groups will use Google Talk to discuss what they learned with the class. To maintain a better understanding of the cultures surrounding us. When students first enter the room they will individually be assigned a country that have previously been selected for them. Once the students have their country assigned to them they will continue to their seats where they will answer the question that has been written on the board. To gain a better understand of what it takes to create ethnical foods. When students first enter the room, they will be given the option of picking an ethnicity they are interested in. They will then need to conduct the research and engage in the ethnicity they have chosen. To learn the basic dynamics of earthquakes. The students will be observing and taking notes about the findings they found relevant during this experiment. They will need to determine how the height of the object and the mass effect the amount of sway the object possesses. The training can also help communication to other businesses for international trade etc. An expert will be paid to come into a business and go through the steps that need to be taken in order to be able to use this tool. After this training management should be able to use Google talk Video with ease. This gives people the chance give ideas to their CEO and hear what he thinks about it straight from his mouth. Lower level employee are given a chance to talk to the man (or women) up top. This plan is intended for a business that is going under and the CEO wants to hear ideas from his employees on what to change. Using Google talk Video the CEO will be able to hear ideas from lower level employees no matter where he might be. This plan is intended for businesses to expand the amount and variety of people they interview without breaking the bank. Using Google Talk video Management from a business more easily find exactly what they are looking for in an employee. Google Talk Video has a variety of educational uses. It can be used by educational institutions to stay in touch without using expensive equipment. Students, faculty, and staff could all interact using Google Talk Video. Documents and files can also be shared online while you are chatting, allowing you to share your work for review with others. Google Talk (without the video) is accessible using your mobile phone, so you can send and retrieve messages from virtually anywhere. Google talk is also very user friendly, so people with little experience communicating online can use it. The video portion of it requires a bit more knowledge of computers, but it can be used with the help of a technician if necessary. Many students use an internet instant messaging system like AIM to communicate with their friends online; Google Talk Video is a lot like AIM, but it has a lot more potential for educational uses. Being able to see who you are talking to and share files make it more school-friendly. Google has taken several measures to ensure the privacy of its users. However, safety is always an issue when you are dealing with students using computers. Monitoring the students closely is the best way to assure that they are talking to who you think they are talking to. Google Talk Video is safer than AIM, because in order for another person to talk to you, you have to accept them. Every user also has to have a Gmail account, although this may change in the future. How Can Teachers Use G-talk Video Internationally to Benefit their Classroom? Teachers can use G-talk Video as an international tool in their classrooms. With G-talk Video, students can interact with students from different countries. On the one hand, it will provide students additional opportunities to get acquainted with cultures and history of another country via chatting, which undoubtedly brodens the views of the students. On the other hand, with the G-talk Video, teachers can observe how the same class is going on in another country in real time, which will benefit them a lot in teaching strategies. Except for communicating with teachers and students abroad, G-talk Video will have great value in instruction of language and motor skills. Disadvantages of Using G-talk Video as an International Tool? As we all know, G-talk Video is web-based, it can only work where a good Internet connection is readily availabe. This limits the people who can access this tool. The second problem is that the quality of connection influences the quality of video and audio greatly. If the connection is not good enough, the video image will be too vague to figure out. Meanwhile, one will not be able to hear what the other is talking about. The third is that the internet is not free though one doesn't need to pay for the tool itself. It is reported that in some part of the world, especially the backward regions, it is rather expensive to connect to the Internet. Such a large extra cost cannot be neglected. How is it Used Differently Internationally? There are mainly two differences: the language and cultures. If one wants to video chat with a person from another country, the two should have a way to understand each other. For example, they can both speak English though one of the two is from China. Another difference is about the cultures. Different countries have different cultures. In a video chat, one can see the gestures of others. The same gesture in different cultures may have different meaning. If one of them hasn't noticed that, it may bring about some misunderstandings. I'm Amanda Roberts, and I will be your Project Manager! I am very excited about this project, and I hope that all of you are too! Let's get things started by introducing ourselves. If everyone could leave a short introduction as well as their e-mail, that would be great! I'm an elementary education major, and I'm from Frankfort, Indiana. I would like to teach lower level elementary grades, kindergarten in particular! Im Corryn Brown, a math education major from Clifton, Virginia. My name is Mary Beard, and I am a Consumer and Family Sciences Education Major. I am from Hammond, Indiana. Can't wait to get to know everyone! My name it Tyler Haney, I am a Social Studies Education Major and I am from Thorntown, Indiana. My name is Adrienne Schenkel, I am an Elementary Education Major and i'm from Boston, Massachusetts! I have added a Research page, so use my posts as a guide to help you format your own. Remember, each person in the group must have 3 research postings before Tuesday, March 31. This means the deadline is MONDAY, MARCH 30 BY MIDNIGHT. P.S.-- My Purdue e-mail is robertam@purdue.edu and my Gmail e-mail is amroberts90@gmail.com. Also, please be thinking about which roles and responsibilities you would like to have for this project. Just look at the Roles and Responsibilities "child" above, and it should help come up with some ideas to think about. It's nice to meet everyone! So is there an actual webpage that you have? There are several pages at the top that we will be putting information into. For the Research Assignment, please put your info in the Research Section. Hi, everyone. I am sorry I am late. I am Dan Tao from Beijing Normal University. And my major is educational technology. Hi,everyone! My name is Cui Fangfang,I major in early childhood education . Now I study in Beijing Normal University. I made some comments on the Research page, so please look at them. are using that isn't yours! We don't want to get in trouble for plagiarism. Looks awesome good job team!!! Our page is looking really really REALLY good! I'm so excited!! We are almost finished!! Great job team!! 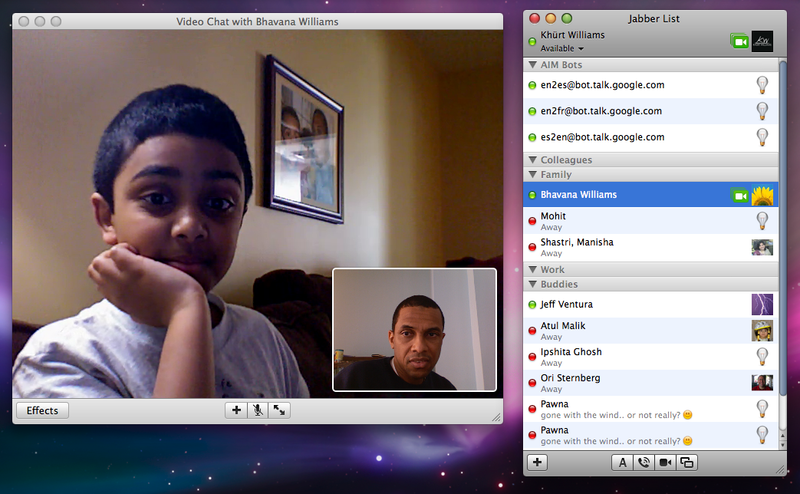 I have used Google Talk Video a few times before and I think it is a really useful application. This application is very simple to set up and use. I think most students would have no trouble figuring out how to use Google Talk Video. When I tried to use Skype for the first time I had some difficulties placing a call however I have never experienced any problems with Google Talk Video. I think that this application could definitely be used in the classroom. Students could communicate with each other outside of the classroom for a wide variety of different projects and assignments. Some of the lesson plans included on the site even suggest students being taught a lesson by their teacher via Google Talk Video. I think Google Talk Video would be a great tool for students to use because it is simple to set up and there are a million ways to use it in the classroom. I would give this application 5 out of 5 stars.